During the monsoon season, the treks are virtually empty of travellers. Most rain usually comes at night; days are cloudy with less rain. The north side of the Himalayas is in rain shadow, meaning that the mountains somewhat block the rain. Annapurna Circuit is in rain shadow after Pisang. The skies are still cloudy and it rains occasionally. In mornings the skies may be clearer, but the views are still nowhere as good as during the trekking season. Landslides may block the trekking routes. See also the Nepal climate section. There are treks suitable for a wide range of experience and physical fitness. If you can walk uphill for a few hours each day, then you can find a suitable trek in Nepal. An easy trek with Nepali support (guide/porter) and teahouse accomodation is quite attainable for anyone who is reasonably fit. Longer treks, crossing high passes and into remote regions demand a higher degree of endurance. For Trekking Peaks, i.e. summitting a mountain of 5650-6500m, it is desirable to have some alpine climbing experience. It is possible to buy or rent everything you need in the Thamel neighborhood of Kathmandu and in the Riverside neighborhood of Pokhara, although it is better to use footwear that is already broken in. Good bargains can be had on fleeces and down jackets but the knockoffs of brand name goods sold in Nepal are not good quality. For the more difficult treks involving mountaineering, crampons and ice axes may be required. A simpler type of crampons, which attach to the shoe using a rubber ring, are easily obtainable in the Thamel neighborhood. These are variously known as spikes, microspikes and chains. Police check points are numerous and unavoidable and park officers can check your permits at any time, with a fine of double the normal cost if you are caught without the proper permits. Do not try to bribe officers or police personnel; it might get you in more trouble than you think. Most of the time there will be two or 3 permits, one will belong to conservation area or national park, another will be Trekkers Information Management System (TIMS) Card and the last one is restricted area entry permit. You will generally need the first two permits, and the third if you are in a restricted area, of these permits. Treks in these areas only require national park entry tickets (NPR2000-4000 for a single entry) and a “TIMS (Trekker Information Management System) card”, but do not require “special permits”. There are two types of TIMS cards: green (for independent trekkers, NPR2,000) and blue (for trekkers who are part of a group with a guide, NPR1,000). Individual TIMS (green cards) are obtainable only from Nepal Tourism Board offices in Kathmandu and Pokhara and from the Trekking Agents Association of Nepal office. Not even Trekking Agents are legally authorized to obtain individual TIMS (even though some small Trekking Agents may offer the individual TIMS). For information on how to get a TIMS card, see TIMS Nepal. Make sure that you bring the required insurance documentation and passport-sized photographs when applying. As of June 2017, Annapurna Conservation Area entry tickets were Rs2000 and Sagarmatha National Park entry tickets were Rs3400. Restricted areas such as Dolpo, Upper Mustang, Manaslu,Tsum Valley, Nar-Phu, and Kanchenjunga require “trekking permits” (As long as you holding a special restricted trekking permit, a TIMS card isn’t required), which are obtainable only through Local trekking agencies.And you are not allowed to travel alone, which means you should have at least one guide or porter when trekking in restricted areas. There are 33 mountain peaks in Nepal of 5,650-6,500m height classified as trekking peaks. Climbing permits for these peaks cost $350 USD for one to four members, an additional $40 USD each for the next four members and $25 USD each for the final four members. Trekking peaks require a qualified “climbing guide”, permits and deposits to cover camp waste disposal. Trek legally. If you trek independently, you are not allowed to take any staff by law. You need for this a Trekking Agency, the sole authorized to employ staff for foreign trekkers. Do not hire staff or “independent guides” through hotels, unless they have a Trekking Agent licence or offer this service through an affiliated Trekking Agent. Note the pollution and lack of trash management in the villages on the treks – including trash-clogged rivers and mounds of discarded beer bottles. Nepal is struggling with its rapid Westernization and hasn’t yet figured out how to dispose of its waste. Don’t contribute to the problem any more than necessary! After your trek, you can give your clothes to the porters’ clothing bank which is managed by the KEEP association This bank is located in the Thamel neighborhood of Kathmandu and provides clothes to the trekking porters. Jomsom Muktinath Trek (5-10 days) – treks to Jomsom, a village on the other side of the Annapurna mountains that can also be reached by air, and Ghorepani, a village that is 2,750m above sea level. This area is always very windy. 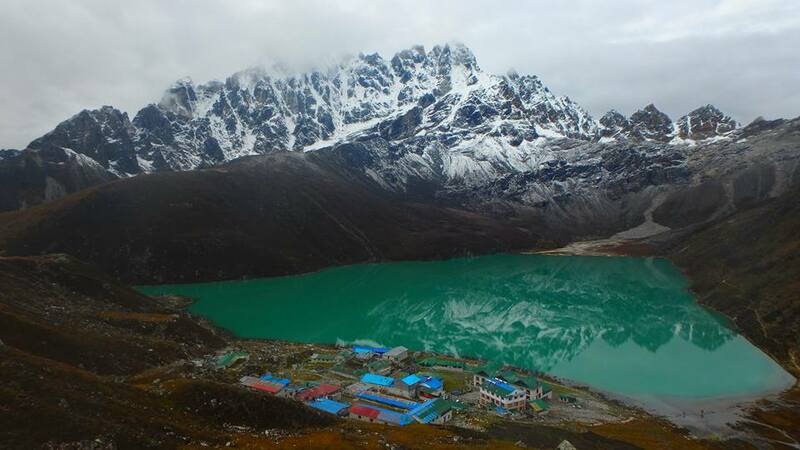 Lahachok Trek (2 days) – This trek offers a scenic beauty and an old settlement in rich culture. The trek begins from Milanchok, Hynaja. The highest point of this trek is Deurali Temple located in Armala Hill of Dahachok. Travellers can see the panoramic view of Pokhara Valley from the Armala hill of Dahachok. Naar-Phu Valley Trek (12-15 days) – a hidden Tibetan valley just north of the Annapurna Circuit which was opened to visitors in 2002. Entrance is form Koto near Chame, and exit via 5300m high Kang La pass to Ngawal. A few basic lodges, but camping style trek still recommended. Nine days from Koto to Ngawal with two days in each major village Phugaon and Naar. Mera Peak (Trekking Peak) – During the ascent of Mera Peak (6461 m), enjoy panoramic views of Mt. Everest (8,848m), Cho-Oyu (8,201 m), Lhotse (8,516 m), Makalu (8,463 m), Kangchenjunga (8,586 m), Nuptse (7,855m), and Chamlang (7,319m). Please read up extensively on Altitude sickness. Be familiar with the symptoms and do not ignore them. Be sure to keep to a conservative ascent schedule and drink plenty of fluids. If you or anyone in your party begins to experience symptoms of acute mountain sickness (AMS), do not ascend any further, and if they do not improve, then descend to a lower altitude. Carry some diamox (acetazolamide) pills, which can be bought in pharmacies in Nepal. Diamox forces the kidneys to excrete bicarbonate in the urine, therefore making the blood more acidic, which stimulates breathing, increasing the amount of oxygen in the blood. Note that diamox is not an immediate fix for acute mountain sickness; it speeds up part of the acclimatization process which in turn helps to relieve symptoms. Many trekkers start taking diamox when they get to 3000m, 125mg bd and then 250 mg bd after 3 days and a preventative measure.It is a diuretic and will make you pass more water. It does not appear to have an major side effects. You may notice tingling in hands and feet though. this will stop at cessation of medication. Perhaps get your doctor to prescribe before you leave home. There is some talk of “fake” meds from India. This may take up to a day or two, and requires waiting without any further rapid ascent. It is often advisable to descend if even mild acute mountain sickness is experienced. If serious sickness is encountered or symptoms of high-altitude pulmonary edema (HAPE) or high-altitude cerebral edema (HACE) occur, descent with another trekker is A MUST. There are only three things to do if you get AMS. Descend, Descend, Descend. Please consult the pharmacist when purchasing Diamox and do your own research. There is also a free talk in Manang given on altitude sickness every day during season. One thing that is often overlooked is that your body requires large amounts of water at altitude to counteract sickness so be sure to drink more than you are used to! For drinking water, the best practice is to treat all water as being contaminated – especially water in the cities. Although bottled water is often available, the disposal of the plastic bottles is a serious problem with no easy solution. Please do not buy bottled water on the trek as there are no rubbish disposal systems on the trek. It is less expensive and better for the environment to treat your own water. The main two options for trekkers are to use the safe drinking water stations along the trek for a small fee or bring your own water purifiers. Chlorination and iodine tablets are available in the main cities. You can also use a filter with a ceramic cartridge which should remove anything 1 micron in size or larger or a UV treatment system such as a SteriPEN which takes care of any viruses, bacteria and protozoa in relatively clear water. You might want to combine the two systems just to make sure you have made the water completely safe. Use treated water for drinking and for brushing your teeth. Before the departure check that your travel insurance covers trekking activities and the conditions. Be aware that some insurance companies view even walking in the mountains as “mountaineering” and will not provide coverage. You may have to shop around. Most reputable trekking agencies will require proof of rescue insurance before you start on your trek. It would be very costly to pay a helicopter rescue at 5000 meters.